Woke up this morning to a snow covered garden. Wasn’t expecting that. It looked pretty for a little while and then it got above freezing and began to drip, drip drip. By the time I got out to shovel the walk, most of it had melted off the concrete which made it quite easy to finish the job. The Dashwoods were very disappointed we did not let them out into the garden. I didn’t want another cold feet incident like last time. And left in the run, they kept going in and out of the coop because it was chilly and damp out. The snow overnight also pointed out to us that we really need to put a tarp around the run to keep the snow out. A friend who has chickens suggested to put it all around, not only does it keep out the snow, but also the wind and it acts as a kind of greenhouse and keeps it warmer inside the run. So that is in progress. The dirt on the green roof is frozen solid so the solar panel and battery pack got Mickey Moused onto the side of the coop just above the solar panel for the outdoor motion activated security light. That was the easy part. As Bookman was up on the ladder and readying the staple gun to begin attaching the string of lights, I laughed and said, let’s not make this a Christmas Vacation event. Bookman laughed. Good one! Then a few seconds later the swearing began. He missed with the staple gun and put a staple through the light string that sliced it in two. He managed to splice the wire together and wrap it in tape. Then he thought he’d see if they worked so pushed the on/off button several times. Nothing happened because the lights are light sensitive and even if the button is on, the lights will not come on until it is dark. I had told him this, but… I had it all set up beforehand because I took the lights into a closet to turn them on and select the twinkle mode. Now, we had no idea if they were on or off. And even if they were on we were not sure Bookman’s splicing would work. So, he kept stapling and the rest of the lights went up without incident. Nothing else we could do but wait for dark. The sun went down and the lights did not come on. I’d take a photo but instead of 250 strands of lights we have one strand with 200 lights on it and I don’t have a camera that will take a decent photo in the dark. Rest assured, they are pretty (pale blue-white) and the neighbors have commented on how festive it looks. The only downside about them is that since they are solar and there hasn’t been much sun lately, the battery doesn’t get a full charge and so they only stay on for about an hour or so before they run out of power. We had a little bit of sun late in the day yesterday which gave us about three hours of lights last night. I forgot what a cloudy month December tends to be. Come January, a very sunny month, those lights will be blazing all night! The Dashwoods are tucked into the coop by the time the lights come on so they have no comment to make upon the decor. Yesterday was a mixed sort of day. The cycling itself on the trainer indoors was great fun. There was a 24-hour Zwiftathon going on with group rides every hour. Some of the ride leaders were professional cyclists. I got to ride with Eros Poli, a Tour de France stage winner and Olympian. Unfortunately, through some sort of snafu, I never saw him. The leader beacon didn’t turn on until very late in the ride after the 300 riders in the group had gotten lost and separated into a bunch of different groups because no one could find Poli. The same thing happend on the second group ride with another pro-cyclist. I was so discouraged I almost didn’t do the third ride I had planned on. I am glad I did because this third ride was awesome and great fun. Heather Wurtele was the rider leader. She is a professional triathlete. Very nice woman. The leader beacon worked this time and she was vocal, giving directions, keeping everyone corralled together. And she was friendly and chatty which made everyone else friendly and chatty too. Good fun! All this was for World Bicycle Relief. 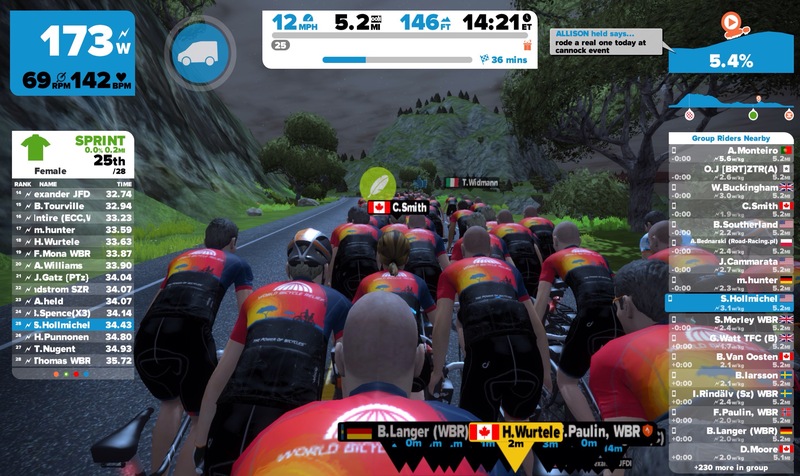 If Zwifters rode 200,000 miles/ 321,869 km on sanctioned group rides (one went off every hour for 50 minutes and generally covered 19 miles/30.5 km), Trek (a big bicycle company) would donate $45,000 to WBR. I don’t know what the final mileage was but by noon I had heard participants had already logged over 200,000 miles. In case you have not heard of WBR, they are a nonprofit organization that provides bicylces to students so they can go to school and healtcare workers in Africa (and South America and Southeast Asia). It is a good organization that does good work that really makes a difference. I also went to the dentist yesterday for a cleaning. Remember when I had my little bike accident over the summer and landed on my face, chipped a couple teeth and sprained the ligaments? I still can’t bite. One of the teeth is still sensitive, not like it was originally, but enough so that the dentist is concerned. So he referred me to an endodontist who will determined whether or not the tooth is still getting a steady blood supply and just taking a long time to heal, or if the blood supply keeps getting interrupted (which might be the cause of the sensitivity). If the latter is happening, I will need a root canal. The endodontist is not open on the weekend so I will have to call tomorrow (Monday) to set up a consultation appointment. Sigh. At least if I do need a root canal it doesn’t affect my cycling, not like getting hit by a car and breaking my collarbone, arm, or leg would. Bright side! good luck at the endodontist. That’s a specialty you don’t want to know about until you need one! Thanks Jeanne! I am keeping my fingers crossed! Good… looking on the bright side of life. 🙂 sounds like a beautiful winter season for you! The Christmas Vacation clips made me laugh and supplemented the storytelling well. The group rides look so cool! Wanderwolf, glad you enjoyed the Christmas Vacation clips! The weather has been unusually warm and while that has had a pleasant side, it is hard to truly enjoy it because I can’t help thinking that this is what climate change means. The group ride was really cool with everyone wearing the same jersey. Really fun! Stay warm and good look with the endodontist! jenclair, staying warm has been pretty easy so far, I still haven’t had to wear my winter coat which is crazy. And thanks, I am trying to not worry about the endodontist too much! Maybe you’ll let the Dashwoods stay up past their bedtime one night so they can admire their decorations. I laughed at your National Lampoon Christmas clips – thanks! I bet your lights do really look festive. I wish you well at the endodontist. I had a root canal about 7 years ago and I have to say that it went a lot better than I anticipated. I’m a total wimp with stuff like that and it wasn’t so bad. Laila, glad you enjoyed the clips! The lights are really fun and even thought the lack of sunlight means they run out of power pretty fast, they are generally lit up as people drive by on their way home from work so hopefully it makes them smile. And thanks for the good wishes! I am hoping he will say let’s wait another month and see what happens. But I am glad to know you had one and it was no big deal. I know too many people glad to impart their horror stories! All my fingers are crossed that you do not need a root canal. That would be seriously miserable for a variety of reasons. Hopefully it is just a slow healer of a tooth!! The lights sound fun and festive (after the swearing and getting them attached of course). What did the Dashwoods think? Have they checked out the lights yet? And yes, we have arrived at Dreary December all right!! I’m already growing tired of the cold. Three more months to go! 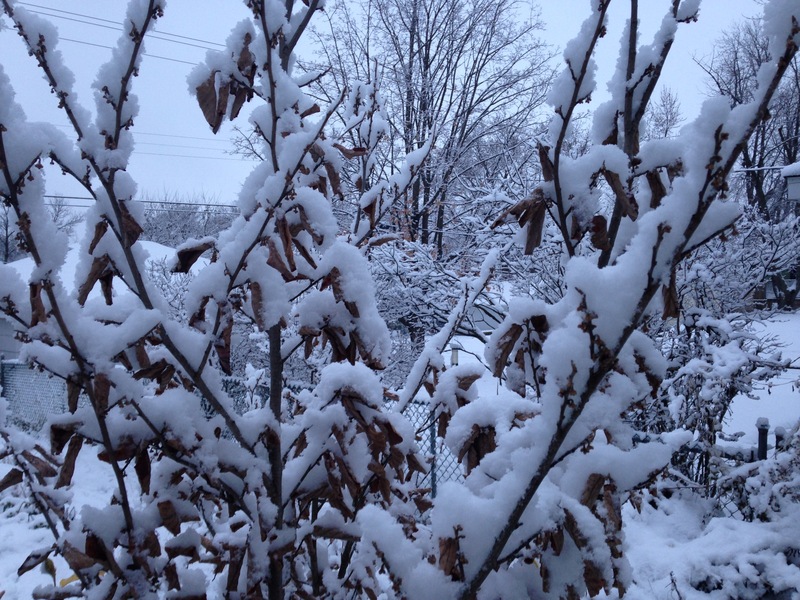 And how will the Dashwood deal with your winter? I thought chickens are domesticated, indoor creatures? Definitely not as hardy as our Mallards. No? Arti, the Dashwoods are winter hardy breeds and they have put on some nice down under their regular feathers. They don’t like walking on snow and need to be kept out of the damp and wind. Other than that, they should do ok. We have a heat lamp in the coop for late winter in case we have a string of subzero F days. A friend of ours who has kept chickens for a number of years says she doesn’t heat her coop at all. So we’re watching and waiting to see how it goes! Fingers crossed against you getting a root canal! Hopefully it will be okay. A person who expends so much effort getting Christmas lights sorted out for a chicken coop deserves NO ROOT CANALS EVER. I was just mentioning to my husband that we should watch that movie! haha… I think I’m going to have to watch it now. Good luck with the tooth issue! Iliana, hehe, yeah I think I am going to have to watch it now too. We usually watch it every year but for some reason we didn’t last year. And thanks, hopefully if I do have to have a root canal it won’t be as bad as I fear.